A few months ago, I was editing some online German courses, and I came across one of my biggest peeves in discussions of language: false cognates that aren’t. If you’ve ever studied a foreign language, you’ve probably learned about false cognates at some point. According to most language teachers and even many language textbooks, false cognates are words that look like they should mean the same thing as their supposed English counterparts but don’t. But cognates don’t necessarily look the same or mean the same thing, and words that look the same and mean the same thing aren’t necessarily cognates. In linguistics, cognate is a technical term meaning that words are etymologically related—that is, they have a common origin. The English one, two, three, German eins, zwei, drei, French un, deux, trois, and Welsh un, dau, tri are all cognate—they and words for one, two, three in many other language all trace back to the Proto-Indo-European (PIE) *oino, *dwo, *trei. These sets are all pretty obvious, but not all cognates are. For example, the English four, five, German vier, fünf, French quatre, cinq, and Welsh pedwar, pump. The English and German are still obviously related, but the others less so. Fünf and pump are actually pretty close, but it seems a pretty long way from four and vier to pedwar, and an even longer way from them to quatre and cinq. And yet these words all go back to the PIE *kwetwer and *penkwe. Though the modern-day forms aren’t as obviously related, linguists can nevertheless establish their relationships by tracing the them back through a series of sound changes to their conjectured historical forms. And not all cognates share meaning. The English yoke, for instance, is related to the Latin jugular, the Greek zeugma, and the Hindi yoga, along with join, joust, conjugate, and many others. These words all trace back to the PIE *yeug ‘join’, and that sense can still be seen in some of its modern descendants, but if you’re learning Hindi, you can’t rely on the word yoke to tell you what yoga means. Which brings us back to the German course that I was editing. Cognates are often presented as a way to learn vocabulary quickly, because the form and meaning are often similar enough to the form and meaning of the English word to make them easy to remember. But cognates often vary wildly in form (like four, quatre, and pedwar) and in meaning (like yoke, jugular, zeugma, and yoga). And many of the words presented as cognates are in fact not cognates but merely borrowings. Strictly speaking, cognates are words that have a common origin—that is, they were inherited from an ancestral language, just as the cognates above all descend from Proto-Indo-European. Cognates are like cousins—they may belong to different families, but they all trace back to a common ancestor. Of these, only gold, hand, land, sand, and wind are actually cognates. Maybe it’s nitpicking to point out that the English jaguar and the German Jaguar aren’t cognates but borrowings from Portuguese. For a language learner, the important thing is that these words are similar in both languages, making them easy to learn. The German word is on the left and the English word on the right. Once again, many of these words are borrowings, mostly from French and Latin. All of these borrowings are clearly related, though their senses may have developed in different directions. For example, chef generally means “boss” in French, but it acquired its specialized sense in English from the longer phrase chef de cuisine, “head of the kitchen”. The earlier borrowing chief still maintains the sense of “head” or “boss”. But some of these words really are cognate with English words—they just don’t necessarily look like it. Bad, for example, is cognate with the English bath. You just need to know that the English sounds spelled as <th>—like the /θ/ in thin or the /ð/ in then—generally became /d/ in German. On a related note, that most notorious of alleged false cognates, the Spanish embarazado, really is related to the English embarrassed. They both trace back to an earlier word meaning “to put someone in an awkward or difficult situation”. false friends. This term is broad enough to encompass both words that are unrelated and words that are borrowings or cognates but that have different senses. This isn’t to say that cognates aren’t useful in learning a language, of course, but sometimes it takes a little effort to see the connections. 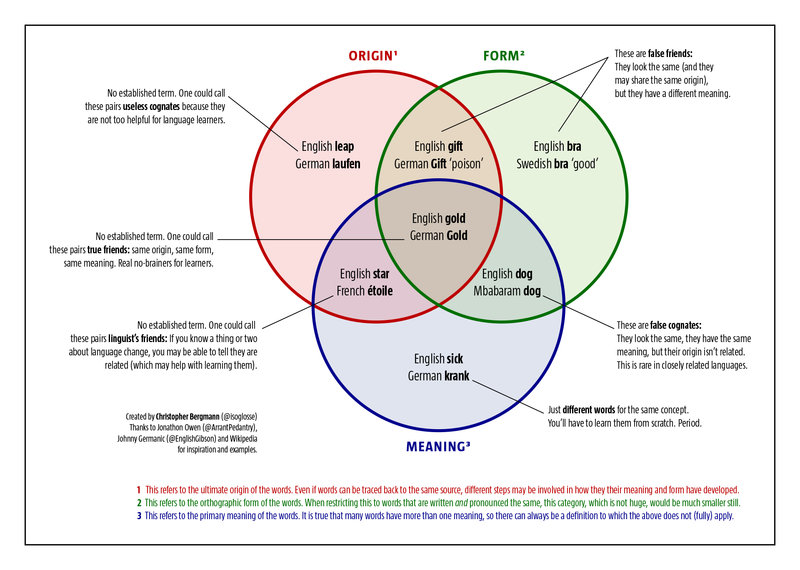 For example, when I learned German, one of my professors gave us a handout of some common English–German sound correlations, like the th ~ d connection above. For example, if you know that the English /p/ often corresponds to a German /f/ and that the English sound spelled <ea> often corresponds to the German /au/, then the relation between leap and laufen “to run” becomes clearer. Or if you know that the English sound spelled <ch> often corresponds with the German /k/ or that the English /p/ often corresponds with the German /f/, then the relation between cheap and kaufen “to buy” becomes a little clearer. (Incidentally, this means that the English surname Chapman is cognate with the German Kaufmann.) And knowing that the English <y> sometimes corresponds to the German /g/ might help you see the relationship between the verb yearn and the German adverb gern “gladly, willingly”. You don’t have to teach a course in historical linguistics in order to teach a foreign language like German, but you’re doing a disservice if you teach that obviously related pairs like Bad and bath aren’t actually related. Rather than teach students that language is random and treacherous, you can teach them to find the patterns that are already there. A little bit of linguistic background can go a long way. Plus, you know, real etymology is a lot more fun. Click to see the full-sized image. Just really needed to know the cognate of ” gern “. Of course, once you see it, it’s terribly obvious. You really confused me about “false cognates,” until I finally got to you changing it to “false friends.” I would have thought, as in that chart, that “false cognates”are words that look related, but aren’t. Getting back to your distinction between “cognates” and “borrowings.” One thing that fascinates me is when a language has a word, but then later borrows another version of that same word, so to speak. For example, Spanish has the native word “hierro” for iron that went through the usual sound changes. But then if the 15th century borrowed the same word, so to speak, from Latin, but in the form of “férreo,” as if they forgot that they already have that word or something. You’re saying I shouldn’t call them cognates? I’m not sure what part confused you. False cognates are indeed words that look related but aren’t. If I made a mistake somewhere, could you point out where? Honestly, I’m not sure if those should be called cognates or not. Wikipedia says that doublets and loanwords aren’t cognates, but I don’t think I’ve seen that definition used anywhere else. I had always considered words that have a common origin—even one one of the words was ultimately borrowed. But I also wouldn’t call a recent loanword a cognate. For instance, it seems absurd to say that the English word weltanschauung is cognate with the German Weltanschauung, because that seems to imply that the two trace back to some common origin in the past. But I don’t really have a problem with calling shirt and skirt cognate, even though skirt was borrowed into English from Old Norse. So even if some people are pretty strict in their terminology, I’ve never been quite that strict myself.